When it comes to intimidating legal terms, the word “lien” ranks high on the list – especially when it comes in the form of a letter from your medical provider or insurer. If you are involved in a personal injury claim in Arkansas, you may have received a letter like this. What does it mean? Are you in legal trouble? Will collection agencies come knocking at your door? What should you do? Let’s answer these questions in another installment of Taylor King Law’s Tackling Legal Terms blog series. Lien: What Does It Mean? Legally, a lien is defined as the “legal claim that someone or something has on the property or funds of another person until a debt has been repaid.” When someone files a lien, they are simply “getting in line” to receive compensation for services or goods that they’ve provided. 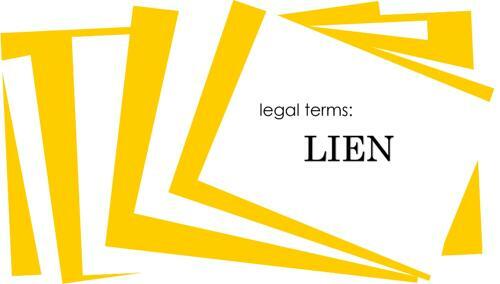 Liens are part of daily life for many Americans, whether or not they’re aware of it. Will a lien negatively impact your life or your credit? That depends on the type of lien. You agree to Consensual liens when you make certain purchases, like a vehicle. A mortgage is a type of consensual lien. As long as you continue making payments on your vehicle or house, your credit score is not negatively affected. Statutory liens, also called non-consensual liens, are granted through a court process. The purpose is to file a claim on unpaid bills. Tax liens, which the government places on someone’s property when they do not pay their taxes, are an example of statutory liens. Liens in Arkansas: What’s the Law? The Arkansas Code of Laws contains specific information on the process of filing valid liens in Arkansas. You can view the 2017 version here: Arkansas Code Chapter 18, Subtitle 4.
Who Can File a Lien on my Personal Injury Claim? Most of the time when we receive questions about liens, it’s in the context of a personal injury case. Having a lien filed is fairly common and does not pose a threat to you as the accident victim. Providers do this to ensure they are repaid for the medical care or bill coverage they’ve provided. A few different organizations may file a lien on your personal injury settlement: health insurance carriers, car insurance carriers, Medicare, Medicaid, and healthcare providers. Those liens will be fulfilled from your settlement amount, so you do not have to pay anything out of pocket for them. A provider’s right to file a lien must be balanced with Arkansas’s “Made Whole” doctrine, which states that your right as the victim to be “made whole” is just as important as the provider’s right to payment. If a personal injury lawyer handles your case, your lawyer will work to ensure you have been “made whole” before paying liens. The firm will also take care of paying those liens before you receive your final check. If you suffered injuries in a car accident, dealing with medical providers, insurers, and liens may be the last thing on your mind. Taylor King can help. With more than 20 years of experience and a highly skilled team of lawyers, Taylor King Law will fight your legal battles for you so that you can focus on treatment and recovery. Don’t wait to begin your free consultation. Call 1-800-CAR-WRECK (227-9732), or submit an inquiry at www.taylorkinglaw.com. We are On Your Side, By Your Side.